“As a trading nation, it is critically important that Canada continues to lead the way in demonstrating that liberalized trade is an important vehicle for wealth creation for the middle class”, said Mr. Jan Westcott, President and CEO of Spirits Canada. Each and every bottle of Canadian Whisky and other Canadian Spirits starts with premium cereal grains grown by Canadian farmers. These barley, corn, rye and wheat cereals are then mashed, fermented, distilled, and aged in Canada creating important manufacturing jobs here at home. Before leaving the country, tremendous value is added to these rather modest cereal grains through the consumer branding process. Aided and supported by thousands of small and medium-sized businesses, Canada’s leading Spirits manufacturers create employment and economic activity across the country. 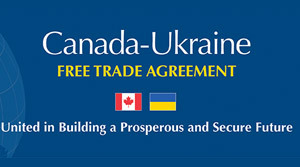 “Global Affairs Canada trade officials are amongst the very best in the world at what they do, and we heartily applaud their efforts in reaching a successful conclusion in their negotiations with the Ukraine”, added Mr. Westcott.